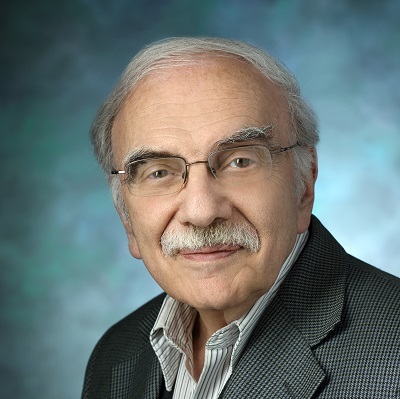 Dr. L. Mario Amzel is a Professor and director of the Department of Biophysics and Biophysical Chemistry of the Department at the Johns Hopkins University School of Medicine. Structural enzymology of redox and phosphoryl-transfer enzymes: MICAL, PI3K, FPPS, PAM, and Nudix hydrolases. Selected areas of structural thermodynamics, and regulation and mechanism of channels and transferases. Structural Mechanistic Biochemistry. Enzymes play a key role in all metabolic and cell-signaling processes. Characterization of an enzyme’s biological function must include the description of its mechanisms at an atomic level. Our laboratory is deciphering the catalytic mechanism of several enzyme families, using a combination of molecular biology, biochemistry, and structural Biology. Systems under study fall into two classes: 1) Enzymes that recognize or process phosphates (pyrophosphate hydrolases (Nudix enzymes), farnesyl pyrophosphate synthases, phosphinositide-3-kinases (PI3K), and redox enzymes (flavoenzymes, and copper hydroxylases, and non-heme iron diooxygenases). All experiments necessary to address mechanistic questions are carried out in the laboratory. Cloning and expression, ultrapurification, kinetic characterization, mutational analysis, mass spectrometry, crystallization, and structure determination by x-ray diffraction are some of the techniques we bring to bear to characterize the mechanisms of these enzymes. In addition to being intrinsically interesting some of these systems are being developed as targets for drug design. Structural Thermodynamics. Most biological processes rely upon recognition and binding among macromolecules. We have developed several systems, such as anti-peptide antibodies and lectins, that we are using to study protein-ligand interactions. As part of this research, we are developing computational methods to calculate the changes in the thermodynamic variables (ΔG, ΔH, ΔS) that take place when a protein recognized another macromolecule or a small ligand. Techniques used in this work involve monoclonal antibody development, x-ray diffraction and calorimetry, followed by empirical parameterization, and molecular mechanics/dynamics and statistical mechanics calculations. Results of these studies have a major impact on our understanding of binding energetics, including the estimation of binding affinities for structure-based drug design. Mechanism and regulation of channels and transporters. We are studying the regulation of the cardiac voltage regulated Na+ channel Nav 1.5 by calmodulin using structural and thermodynamic techniques. A major project involves studying the structure and the mechanisms of the I– transport by the Na+ / I– symporter. We are using experimental and computational methods to identify the different molecular species that participate in the transport cycle. Transporters and channels. Ion movements across biological membranes are highly specific processes at the core of numerous moving physiological conditions and disease states. We are studying the mechanism of the Na+ / I–symporter, NIS, and the control of the activity of voltage- activated Na+ channels by two key effectors – calmodulin and Ca2+. O’Handley SF, Thirawatananond P, Kang LW, Cunningham JE, Leyva JA, Amzel LM, Gabelli SB. Kinetic and mutational studies of the adenosine diphosphate ribose hydrolase from Mycobacterium tuberculosis. J Bioenerg Biomembr. 2016 Dec;48(6):557-567. PubMed PMID: 27683242. Ferrandino G, Nicola JP, Sánchez YE, Echeverria I, Liu Y, Amzel LM, Carrasco N. Na+ coordination at the Na2 site of the Na+/I- symporter. Proc Natl Acad Sci US A. 2016 Sep 13;113(37):E5379-88. doi: 10.1073/pnas.1607231113. PubMed PMID: 27562170; PubMed Central PMCID: PMC5027462. Alqassim SS, Urquiza M, Borgnia E, Nagib M, Amzel LM, Bianchet MA. Modulation of MICAL Monooxygenase Activity by its Calponin Homology Domain: Structural and Mechanistic Insights. Sci Rep. 2016 Mar 3;6:22176. doi: 10.1038/srep22176. PubMed PMID: 26935886; PubMed Central PMCID: PMC4792234. de la Peña AH, Suarez A, Duong-Ly KC, Schoeffield AJ, Pizarro-Dupuy MA, Zarr M, Pineiro SA, Amzel LM, Gabelli SB. Structural and Enzymatic Characterization of a Nucleoside Diphosphate Sugar Hydrolase from Bdellovibrio bacteriovorus. PLoS One. 2015 Nov 2;10(11):e0141716. doi: 10.1371/journal.pone.0141716. PubMed PMID: 26524597; PubMed Central PMCID: PMC4629899. Gabelli SB, Yoder JB, Tomaselli GF, Amzel LM. Calmodulin and Ca(2+) control of voltage gated Na(+) channels. Channels (Austin). 2016;10(1):45-54. doi: 10.1080/19336950.2015.1075677. Review. PubMed PMID: 26218606; PubMed Central PMCID: PMC4802738. Nicola JP, Reyna-Neyra A, Saenger P, Rodriguez-Buritica DF, Gamez Godoy JD, Muzumdar R, Amzel LM, Carrasco N. Sodium/Iodide Symporter Mutant V270E Causes Stunted Growth but No Cognitive Deficiency. J Clin Endocrinol Metab. 2015 Oct;100(10):E1353-61. doi: 10.1210/jc.2015-1824. PubMed PMID: 26204134; PubMed Central PMCID: PMC4596044. Echeverria I, Liu Y, Gabelli SB, Amzel LM. Oncogenic mutations weaken the interactions that stabilize the p110α-p85α heterodimer in phosphatidylinositol 3-kinase α. FEBS J. 2015 Sep;282(18):3528-42. doi: 10.1111/febs.13365. PubMed PMID: 26122737; PubMed Central PMCID: PMC4573839. Ravera S, Quick M, Nicola JP, Carrasco N, Amzel LM. Beyond non-integer Hill coefficients: A novel approach to analyzing binding data, applied to Na+-driven transporters. J Gen Physiol. 2015 Jun;145(6):555-63. doi: 10.1085/jgp.201511365. PubMed PMID: 26009546; PubMed Central PMCID: PMC4442788. Wolff KA, de la Peña AH, Nguyen HT, Pham TH, Amzel LM, Gabelli SB, Nguyen L. A redox regulatory system critical for mycobacterial survival in macrophages and biofilm development. PLoS Pathog. 2015 Apr 17;11(4):e1004839. doi: 10.1371/journal.ppat.1004839. PubMed PMID: 25884716; PubMed Central PMCID: PMC4401782. Munns CH, Chung MK, Sanchez YE, Amzel LM, Caterina MJ. Role of the outer pore domain in transient receptor potential vanilloid 1 dynamic permeability to large cations. J Biol Chem. 2015 Feb 27;290(9):5707-24. doi: 10.1074/jbc.M114.597435. PubMed PMID: 25568328; PubMed Central PMCID: PMC4342482. Gabelli SB, Boto A, Kuhns VH, Bianchet MA, Farinelli F, Aripirala S, Yoder J, Jakoncic J, Tomaselli GF, Amzel LM. Regulation of the NaV1.5 cytoplasmic domain by calmodulin. Nat Commun. 2014 Nov 5;5:5126. doi: 10.1038/ncomms6126. PubMed PMID: 25370050; PubMed Central PMCID: PMC4223872. Gabelli SB, Echeverria I, Alexander M, Duong-Ly KC, Chaves-Moreira D, Brower ET, Vogelstein B, Amzel LM. Activation of PI3Kα by physiological effectors and by oncogenic mutations: structural and dynamic effects. Biophys Rev. 2014 Mar 1;6(1):89-95. PubMed PMID: 25309634; PubMed Central PMCID: PMC4192660. Miller MS, Schmidt-Kittler O, Bolduc DM, Brower ET, Chaves-Moreira D, Allaire M, Kinzler KW, Jennings IG, Thompson PE, Cole PA, Amzel LM, Vogelstein B, Gabelli SB. Structural basis of nSH2 regulation and lipid binding in PI3Kα. Oncotarget. 2014 Jul 30;5(14):5198-208. PubMed PMID: 25105564; PubMed Central PMCID: PMC4170646. Nicola JP, Carrasco N, Amzel LM. Physiological sodium concentrations enhance the iodide affinity of the Na+/I- symporter. Nat Commun. 2014 Jun 3;5:3948. doi: 10.1038/ncomms4948. PubMed PMID: 24888603; PubMed Central PMCID: PMC4248369. 10.1107/S1399004713033221. PubMed PMID: 24598749; PubMed Central PMCID: PMC3949514.